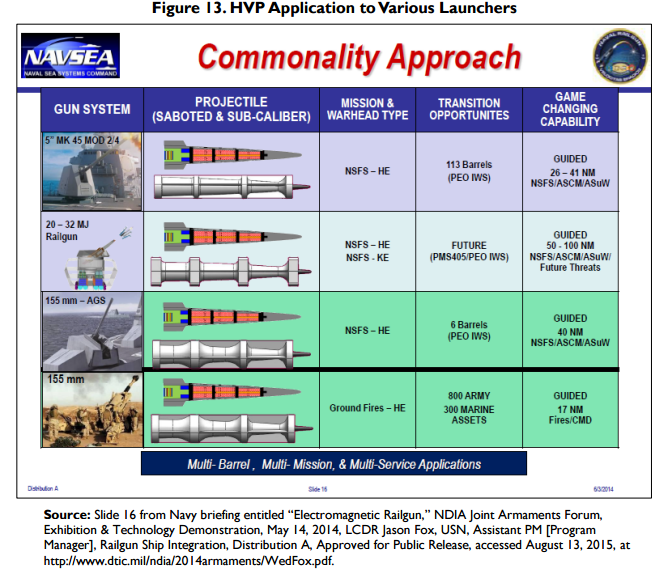 US Defense Department modeling shows that “if we can close the fire support with a controlled solution,” the hypervelocity projectile (HVP) weapons would be able to shoot down most of a 100-missile raid. The guided projectile being developed for EMRG (Electromagnetic Railguns) can also be fired from 5-inch and 155mm powder guns. Navy cruisers each have two 5-inch guns, and Navy Arleigh Burke (DDG-51) class destroyers each have one 5-inch gun. The Navy’s three new Zumwalt class (DDG-1000) destroyers, the first of which entered service in October 2016, each have two 155mm guns. When fired from 5-inch powder guns, the projectile achieves a speed of roughly Mach 3, which is roughly half the speed it achieves when fired from EMRG, but more than twice the speed of a conventional 5-inch shell fired from a 5-inch gun. This is apparently fast enough for countering at least some missiles. It should be noted that Russia and China (and others) are boosting the speed of the missiles as well. Russia is deploying mach 4 missiles and will also follow with hypersonic mach 5 and faster missiles. The faster missiles would not be countered by the hypervelocity anti missile guns. BAE Systems states that HVP is 24 inches long and weighs 28 pounds, including a 15-pound payload. The total length and weight of an HVP launch package, BAE Systems states, is 26 inches and 40 pounds. 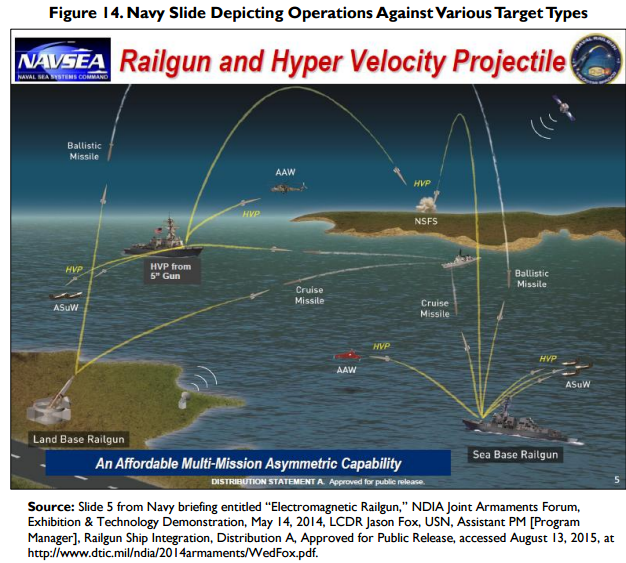 BAE states that the maximum rate of fire for HVP is 20 rounds per minute from a Mk 45 5-inch gun, 10 rounds per minute from the 155mm gun on DDG-1000 class destroyers (called the Advanced Gun System, or AGS), and 6 rounds per minute from EMRG. HVP’s firing range, BAE Systems states, is more than 40 nautical miles (when fired from a Mk 45 Mod 2 5-inch gun), more than 50 nautical miles (Mk 45 Mod 4 5-inch gun), more than 70 nautical miles (155mm gun on DDG-1000 class destroyers), and more than 100 nautical miles (EMRG).